What Next for Boreal Birds? 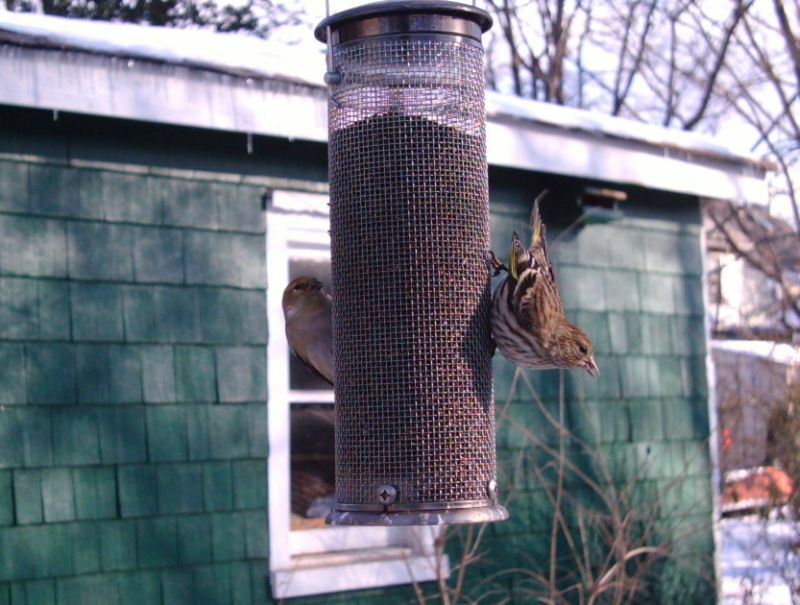 New at the Feeders: Pine Siskins! Domoic Acid Source of Pelican Distress? Rusty Blackbirds have suffered serious decline, as much as 88-98% over the past 40 years. Possible causes include winter habitat conversion and persecution from blackbird control programs. The International Rusty Blackbird Technical Working Group is seeking sightings data to find the locations of Rusty Blackbirds' wintering habitat. To that end, the working group and eBird have organized a Rusty Blackbird Blitz from February 7-15, 2009. Volunteers are asked to visit local sites where they have found Rusty Blackbirds in the past, or that appear to be appropriate habitat, to search for this species during the nine-day period. If the blackbirds are found, report the results to eBird following the blitz protocol. It will be helpful to review the instructions before going birding, as the working group is seeking more information than the usual eBird submission entails. The link includes other useful resources, such as identification information and links to audio recordings. Bird remains from the airplane that crash-landed in the Hudson are being sent to the Smithsonian's Feather Identification Lab for identification. Last year the lab processed remains from 4,600 bird strikes. China has a new bird species, the Nonggang Babbler (Stachyris nonggangensis), found in Guangxi Province. The new babbler forages for insects at ground level. The Emperor Penguin is likely to experience a significant decline, and possibly extinction, in the face of climate change. Current models show the colony at Terre Adelie shrinking from 3,000 birds to 400 by the year 2100. Electronic tags attached to Manx Shearwaters show that the seabirds often make a two-week layover somewhere along their long migration routes. The Rossmoor retirement community in California is ready to go ahead with killing 50 Acorn Woodpeckers for damaging houses. White eyes, birds in the family Zosteridae, diversify faster than any other birds. Most species in that family evolved fairly recently when members of the family arrived in new territory. Modern bird lineages may have survived the mass extinction at the end of the Cretaceous due to their larger brains compared to other avian ancestors. This sounds like a bird blogger's dream: a group of scientists found an unknown oasis by examining Google Earth footage. The recently-discovered forest in Mozambique provides habitat for at least seven Globally Threatened bird species. 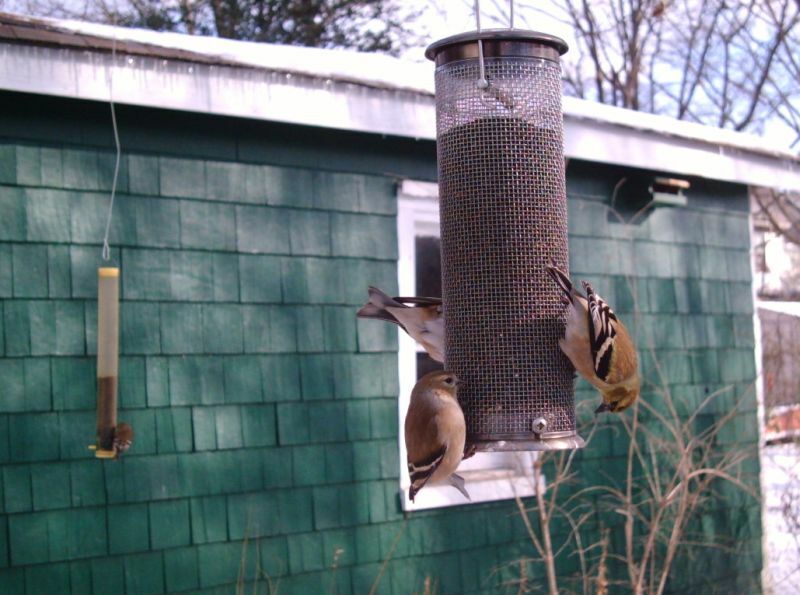 The 2009 Great Backyard Bird Count will begin in two weeks. The U.S. Fish and Wildlife Service is considering removing the Hawaiian Hawk ('Io) from the federal Endangered Species List. A push to restore wolves to Olympic National Park is based on the premise that the lack of a top predator has allowed the elk population to grow to unsustainable levels. Climate models predict a major expansion of ocean dead zones. Canadian scientists are studying the boundary between forest and tundra for any sign of an advancing treeline. NOAA reports that the effects of elevated carbon dioxide levels will linger for the next 1,000 years, even if carbon emissions are completely stopped. The higher the peak carbon levels, the worse those lingering effects will be. Last weekend, I took the train to Washington, DC, to participate in the DC Audubon Society's annual C&O Canal Midwinter Bird Survey. This is an event that I have participated in since 2004 and have helped to coordinate since 2006. Each year volunteers for the survey count birds within their assigned sections along the entire* 184.5-mile length of the C&O Canal National Historical Park. One of the attractive aspects of this count is that it crosses through multiple habitats, from the edge of the coastal plain in Georgetown, through Maryland's Piedmont, and into the Ridge and Valley region. Of the areas covered by the count, my favorite to survey is western Maryland. The bird life is different from what one finds on the Mid-Atlantic coastal plain and the landscape is beautiful. The canal there is bordered by steep hills crowned with pines and other conifers. Moreover, the park is quiet; stand still on the towpath, and the only sounds you will hear are the wind, wild animals, and perhaps a passing train. Western Maryland is where I headed with Jed, another former DC Audubon board member, on Saturday. Our plan called for us to cover an eight-mile section along with another volunteer. We started a mile upstream from the Paw Paw Tunnel and then worked our way downstream, alternating sections. At the south (upstream) side of the tunnel we found an active foraging flock that included at least a dozen Purple Finches. When we emerged from the downstream end of the tunnel, we were greeted by a passing Cooper's Hawk. A Barred Owl hooted softly from somewhere on the ridge above the tunnel, and several Common Ravens appeared overhead and accompanied us downstream. A mile downstream from the tunnel, Jed and I saw a Golden Eagle! A large flock of Common Mergansers had flown past us in a hurry. As we turned to count them, I heard a audible WHOOSH as the eagle stooped in hot pursuit of one of the mergansers. It almost caught it, but when it missed, it wheeled around and started pumping towards us head-on at eye-level. It checked us out and then turned and continued upstream. Unfortunately, it was gone by the time the third member of our party caught up with us. For the rest of the morning we counted small flocks of songbirds as we worked our way downstream. Much to my delight, each mile we covered featured at least one Winter Wren, though none were singing. We had our best results in mile 150 when we encountered one flock of sparrows after another – mostly White-throated Sparrows and Dark-eyed Juncos, with a few Song Sparrows and Swamp Sparrows mixed in. With that we finished a day of good birding. Results from other sections are trickling in here. * Or at least as close to "entire" as we can manage. 80-90% coverage is typical. While I was gone over the weekend, there was a massive bird kill in Franklin Township, not far from where I live. Apparently it was the work of the USDA, but both the Department of Agriculture and Franklin Township have been slow in releasing information. Everything from Avian influenza to West Nile disease, both bird-killing ailments that also affect humans, was feared. But no humans or pets were ever at risk, said the USDA, contending the pesticide, known as DRC-1339, is inert once it is eaten by the birds and becomes metabolized. That part of the story is only now reaching residents in Somerset County's Franklin Township, where officials continued efforts today to help citizens find ways to dispose of the bird corpses filling up their lawns. "Unfortunately, this was also done on a Friday, so the birds died on the weekend when no one was around to respond to calls. I can just imagine it would have been very disconcerting for people to find the birds dead," said Carol Bannerman, a USDA spokeswoman. State agriculture and wildlife officials were notified two weeks ago, along with Somerset County officials. But Ken Daly, Franklin Township's administrator, said the township was told too little, too late. "The only notice we got in the municipal building was on Friday, a second-hand phone call from our county health director that somewhere, sometime the USDA would be culling birds. No one knew what that meant. If we had known it was coming, we could have gotten word out to the residents," he said. The starlings were actually poisoned on a farm in Mercer County but dispersed into nearby Franklin Township before dying. So far I have not seen any reports of species other than starling being affected by the kill. Last weekend Coturnix hosted a science blogging conference down in North Carolina. One session, moderated by GrrlScientist and Kevin Zelnio, was devoted to nature blogging. The session discussed a series of questions, and the audience's written responses are posted here. I'll add my own responses, since I wasn't in attendance. 1. What is a nature blog? What is the difference between nature and science blog writing? What is the difference between nature blog writing and other types of blog writing? I believe that science blogging and nature blogging overlap, but only partially. I think the term "science blog" implies a higher level of professional knowledge than is found on most nature blogs, including my own. Nature blogs can be many things, but it seems the most common subjects are encounters with the natural world. I think the goal depends on the individual blog. I would not try to prescribe what other blogs ought to be doing since ultimately a blog is just a medium for communication. 3. How important are blog carnivals for connecting nature-loving folks (e.g., I And The Bird, Circus of the Spineless, Carnival of the Blue, Oekologie...)? Blog carnivals are useful for drawing attention to one's blog, especially for new bloggers. I think it also serves as a way to build blogger communities by making it easier to find other people writing about similar topics. 4. What do you think about collaborative global sites like: iNaturalist, Faunapolis, Scratchpads, The Internet Bird Collection, UKmoths, Identify a butterfly and Useum? 5. Who is the audience? What are they looking for, what are they finding? My primary audience is random Googlers. Beyond that, there are other nature bloggers, nonbloggers interested in similar topics, and some family and friends. Oh, and, what Respondent #8 said. 6. How much science is (and should or should not be) associated with nature stories and pictures? It really depends on the skills and inclinations of the blogger. Most nature blogs that I read involve at the very least basic taxonomy (i.e., identifying sightings) and some behavioral observations (sometimes with explanations). 7. What is the best nature essay you've read in the past year or so? Why did you like this essay so much? I can't think of one off the top of my head because I have read so much nature writing in the past year. If anyone reading this wants to leave their own answers, go here. At least some of the brown pelicans that have been turning up confused and starving in California were injured by frostbite, thanks to a harsh cold front in early December. Frostbite does not explain the situation entirely, however, since at least some had domoic acid poisoning. Other tests are in progress. Petty's Island in South Jersey will be preserved as a wildlife refuge with eventual public access. The island has Camden County's only nesting pair of bald eagles. Two Ivory Gulls are being seen in Massachusetts – one in Gloucester and one in Plymouth. Net Results: European Goldfinch: established in the U.S.? Mike's Birding & Digiscoping Blog: Not Baited! Outside My Window: Which Chickadee Are You? The average American lifespan has increased by five months over the past few decades thanks to clean air regulations. The increase was even greater in urban areas. On Inauguration Day, Obama stopped pending regulations to delist the gray wolf in Rocky Mountains states and to weaken existing clean-air regulations. Washington state is considering its own cap-and-trade bill. Climate change is killing trees in western states, through less rainfall and longer and hotter summers. RealClimate: State of Antarctica: red or blue? The left engine from US Airways Flight 1549 has been located, and the right engine has undergone some examination. The right engine, which stayed attached to the plane and already has been examined, shows extensive internal damage consistent with an unusually violent collision with a large bird or a number of birds, according to investigators and others familiar with the details. "What appears to be organic material was found in the right engine and on the wings and fuselage," the National Transportation Safety Board said Wednesday, and "a single feather was found attached" to part of one wing. The board's experts will look for similar damage, as well as remnants of birds, when they start going over the left engine. "Organic material"? Is that a more polite way of saying "goose poop"? I and the Bird #92 has been posted. There was a lot of activity at the feeders yesterday. The morning and afternoon snowstorms seemed to keep the flocks coming. Note: Photos are not necessarily in chronological order. As noted before on this blog, tar sands mining to produce oil threatens the survival of bird species that breed in Canada's boreal forest. The report says that almost all the world's biggest oil companies are involved in tar sands extraction in an area of north eastern Alberta which supports at least 292 species of breeding birds. Among globally threatened species are Rusty Blackbird Euphagus carolinus and Sprague's Pipit Anthus spragueii (both Vulnerable), and Olive-sided Flycatcher Contopus cooperi (Near Threatened). The only wild, migratory population of Whooping Crane Grus americana (Endangered) nests at Wood Buffalo National Park to the north, and migrates over the tar sands region, occasionally stopping over at boreal wetlands. Many of the most abundant songbirds and waterbirds of the Americas also breed in the "bird nursery" of the boreal forest, and are already suffering declines because of logging, and degradation of their migration staging sites. Energy policies that reduce dependence on petroleum – not just "foreign oil" – would do much to protect birds threatened by tar sands development. Update: Thanks to John Carlson for this clarification in the comments: "Hi John, Just wanted to point out that the Sprague's Pipit, although vulnerable and found in Alberta, is not a boreal bird threatened by tar sands oil development, but a grassland bird threatened by conventional oil and gas development in the southern portion of the province." The feeders were busy again yesterday when we got another dose of snow. The Pine Siskins were back. At times, finding a place to land on the feeder was a problem. These photos were all taken with a Wingscapes BirdCam yesterday. You can find more at my Flickr site. Cape May hosted a panel on red knot and horseshoe crab managment last week. Roy Miller, fisheries administrator with the Delaware Division of Fish and Wildlife, Department of Natural Resources and Environmental Control, said since 1989, his agency has used a 30-foot bottom trawl in Delaware Bay on a monthly basis to monitor the adult and juvenile horseshoe crab population. Horseshoe crabs are tagged and their migration studied. Beginning in 1998 when management of horseshoe crabs began, Delaware’s harvest quota was 482,000 crabs. It was subsequently been lowered to 362,000, 150,000 and 100,000 horseshoe crabs, said Miller. He said there was a considerable build up of crabs in their trawl survey in 2004 and then a decrease in 2006 and 2007. There was a considerable decline in population from 1990 to mid 1990’s. A trawl survey by Virginia Tech, which works the ocean area just outside Delaware Bay, found a positive trend in the horseshoe crab population. Miller said red knots declined through 2003 with some recent stabilization of the population at a relatively low level in the 12,000 to 15,000 range from both sides of Delaware Bay. In Delaware, a harvest of just male horseshoes crabs is permitted only after June 8 of the year to allow shorebirds undisturbed access to crab eggs. Female horseshoe crabs cannot be harvested at any time, said Miller. The maximum harvest in Delaware is 100,000 crabs per year, he said. It is hard to say what all that means at this point. Even if it has stabilized (and I hope it has! ), the red knot population is still very small and thus extremely vulnerable. I hope that the positive reports are not premature. At about the time of the crash, a government weather radar in Upton, on Long Island, registered something in the path of Flight 1549 that a government scientist, Steve Ansari of the National Oceanographic and Atmospheric Administration, said was consistent with a big flock of birds. Mr. Ansari said it might also have been precipitation. But a specialist in the use of radar to study birds, Jeffrey J. Buler of the University of Delaware, said that the image was more likely “biological than meteorological,” because the amount of radar energy reflected back to the station was smaller than what rain or snow would produce. The radar indicated that the objects were moving toward Upton at about 20 knots, a speed consistent with geese, he said. He also noted that at this time of year, large flocks move between feeding grounds and roosting areas. Assuming that a bird strike caused the crash, what could be done to reduce such collisions in the future? Apparently there has been some angry ranting about killing birds to reduce strikes, as discussed in a thread over at 10,000 Birds. In a human-bird conflict of this type, killing birds is the solution I would hope an airport would turn to last, after trying other solutions. Even if killing birds could be justified, it would be difficult to kill enough – and in the right places – to prevent further strikes. Especially in winter, New York City hosts huge flocks of birds. Each of the local Christmas Bird Counts in the La Guardia area recorded several thousand Canada Geese. Plus there are thousands more gulls, starlings, and other possible culprits. So what could be done instead? Sea-Tac airport in Washington state has managed to avoid fatal collisions with a multi-pronged management program. The 113 acres of wetlands near the airport are heavily forested with trees such as cedars and cottonwoods to keep large flocks of birds from feeding and nesting there, and the port sowed 158,000 native plants known to be unattractive to birds, eschewing all varieties that produce fruits, nuts and berries. The port also developed a grass seed mix containing a fungus that makes it less appetizing to some birds and insects. Port biologist Steve Osmek scares away ducks, and some adult hawks that have already formed their territory at the airport from departing and landing planes with a small pistol that makes a loud noise like fireworks. Since June 2001, nearly 100 raptors have been trapped alive near Sea-Tac and relocated to safer habitats in northern Washington. From September 2007 through August 2008, the FAA recorded that planes struck Canada geese, double-breasted cormorants [sic], house sparrows, rock pigeons and tree sparrows the most -- two strikes per species. Not all of those tactics would work at La Guardia; the area around it is heavily urbanized, so the vegetative changes would probably be irrelevant to the situation. However, Sea-Tac's example does show that airports can reduce bird strikes – and thus reduce dangers for both birds and humans – without resorting to lethal methods. When engaged in a confrontation, Swamp Sparrows sing more physically difficult songs by increasing their speed and frequency range. A CT scan revealed that Archaeopteryx had a more similar ear structure to modern birds than to modern reptiles. It appears to have had a hearing range of about 2,000 Hz, similar to an emu. A coalition of conservation groups recently preserved 120,000 acres in the heart of Appalachia. The area provides important habitat for Cerulean Warbers, Golden-winged Warblers, and other troubled species. A flock of geese is being blamed for the crash of US Airways flight 1549 in New York City, based on transmissions between the pilot and control towers. The NTSB has not yet ruled on the cause. Keep in mind that the I-35W bridge collapse, caused by structural problems, was initially blamed on pigeons, so these initial judgments are subject to change. The good news is that everyone survived. A British birder watched a new life bird get carried away by a hawk. Mike's Birding & Digiscoping Blog: White-winged Crossbills! New Jersey's Natural Lands Trust is due to make a decision about what to do with Petty's Island today. After the removal of cats from Macquerie Island, the rabbit population boomed, causing even more ecological destruction. So now the Australian government plans to attempt eradicating introduced rabbits, cats, and mice fro the island as well. A recent poll shows that about half of Americans have taken steps to increase their energy efficiency and some want to do more. Yesterday the Senate passed the Omnibus Public Lands Act. An environmentalist disrupted a lease giveaway auction by entering bids and thus forcing the oil and gas companies to pay market prices for the contracts. He won bids to drill on 22,000 acres. The Great Lakes were about 20 meters lower in response to a dry climate 7500 years ago. A similar drop in water levels could occur in response to current climate changes. Bug Girl’s Blog: Cochineal: it’s a bug AND a feature! 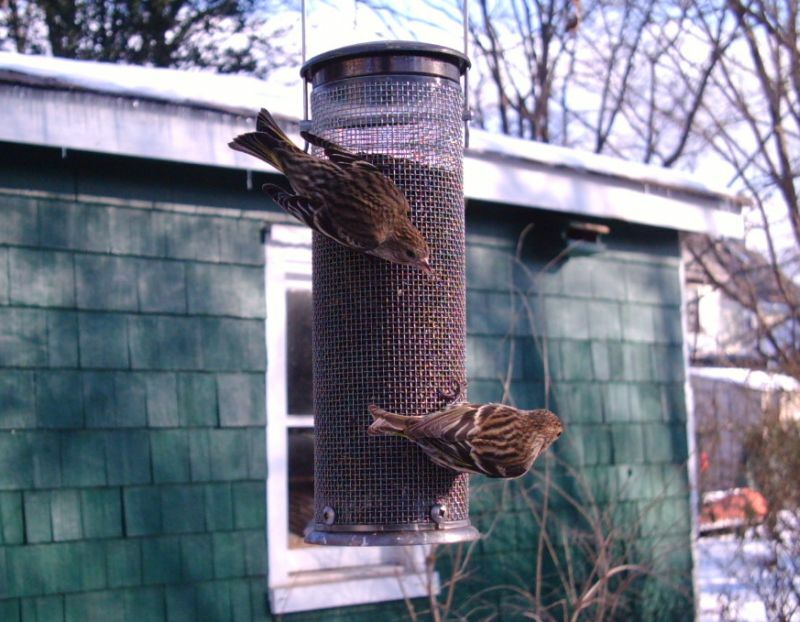 Two days ago a Pine Siskin showed up at the feeders for the first time this winter. I set up my BirdCam yesterday and today, and today I got some pictures of it. At least two siskins were present. Here are a few photographs from today, and possibly more since some of the photos were separated in time. More siskin and goldfinch images available here. Scientists in New Zealand are using dried feces (coprolites) to investigate the diet of long-extinct moa. "Surprisingly for such large birds, over half the plants we detected in the feces were under 30 centimetres in height," says Dr Wood. "This suggests that some moa grazed on tiny herbs, in contrast to the current view of them as mainly shrub and tree browsers. We also found many plant species that are currently threatened or rare, suggesting that the extinction of the moa has impacted their ability to reproduce or disperse." "New Zealand offers a unique chance to reconstruct how a `megafaunal ecosystem' functioned," says Professor Alan Cooper, Director of the Australian Centre for Ancient DNA, which performed the DNA typing. "You can't do this elsewhere in the world because the giant species became extinct too long ago, so you don't get such a diverse record of species and habitats. Critically, the interactions between animals and plants we see in the poo provides key information about the origins and background to our current environment, and predicting how it will respond to future climate change and extinctions." The BBC has a photo of some of the coprolites, which apparently could be quite large – up to 15 centimeters long (i.e., about 6 inches) and 250 kg. Some users appear to be having trouble viewing my blog today. I am working on the problem, but I am not sure yet what the cause might be. My tests suggest that the problem may affect users of Internet Explorer more than users of other browsers. While I work on this problem, it may be better to try using Mozilla Firefox or Google Chrome to view this blog. This layout usually looks better in Firefox and Chrome anyway. Also, I have removed a few widgets from the sidebars to see if they might be the cause. Philadelphia has a third bald eagle nest within its borders. Officials expect the Navy Yard eagles to return to their nest near the Delaware River, perhaps within days. Another pair has built a five-foot nest in a remote area of Pennypack Park in the Northeast. And over the last few weeks, birders have seen a pair of young adults taking sticks to a large oak tree on an island at the John Heinz National Wildlife Refuge at Tinicum. There seems to be some doubt about the viability of the new Tinicum nest. Eagles have been seen fishing all along the Delaware River - as well as at Tinicum - in recent years. But this is the first time the birds have nested at the refuge near the airport since its founding in 1972. The Tinicum nest seems a bit tenuous. The birds are young adults, and have carried just about a dozen sticks out to the tree. "It's a pretty shabby-looking nesting attempt," said Buchanan. Whether the female actually lays eggs this winter - February is typical - and whether the eggs will hatch are questions that have prompted much speculation. Apparently the Navy Yard nest failed in its first year but produced a successful fledge in its second year. So, even if this year's attempt at Tinicum fails, there is still hope for success in the future. That is, provided that a nest failure is not the result of harassment. I find it interesting that bald eagles are carving out territories within cities. Urban areas present disadvantages for a large raptor such as a bald eagle – what habitat exists is likely to have heavy human traffic, and food sources have a higher risk of contamination from runoff and other sources. I wonder if this is a result of better territories being already taken, substantial improvement in existing urban habitats, or a bit of both. What do readers think? According to the International Bird Rescue Research Center, three of the six distressed Brown Pelicans tested in California tested positive for domoic acid poisoning. Samples of phytoplankton collected recently from the waters off of Santa Barbara to Newport Beach were also tested. 5 out of 14 samples indicated very low concentrations. These are the first of many test results expected. Additional blood and tissue samples are being tested and we anticipate more information within the next two weeks. So, domoic acid is part of the problem, but not the only problem, or perhaps even the main problem. Something is seriously wrong when large numbers of birds start to turn up disoriented or starving, so it is not surprising that there is more to the story. I will be watching this case with interest. In the meantime, keep an eye on the IBRRC blog for the latest updates. Brown Pelicans have been turning up tired or disoriented around coastal California. The cause so far is unknown. Wildlife rescuers and researchers have been checking the pelicans for various toxins. Keep an eye on the International Bird Rescue Research Center for the latest on the pelican situation. Argentina's colony of burrowing parrots (the largest parrot colony in the world) is under pressure from the pet trade and development related to tourism and agriculture. Farming in particular has depleted the parrots' food sources. Last year, there were 69 active bald eagle nests in New Jersey, many of them along the Delaware River. Southbound snowy owls can have a tough time: a snowy owl wintering in Albany died from a parasite that it probably picked up from a pigeon. The Scottish government is allowing farmers to kill more ravens to protect young livestock. A new estimate predicts a 1 meter sea level rise over the next century. The estimate is based on the historical correlation between temperature and sea level rather than current trends. This prediction is much higher than the most recent IPCC forecast. President Bush designated three large underwater tracts in the Central Pacific as marine national monuments. If you would like to share a link, please leave it in the comments. The 91st edition of I and the Bird is now available at From the Faraway, Nearby. One of the best bird conservation blogs around, Coffee and Conservation, is a finalist for Best Food Blog in the 2008 Weblog Awards. Julie's blog raises awareness of how American consumer choices affect bird conservation and poverty in Latin America and elsewhere. She also has reviewed many shade-grown coffees, posted tips on how to choose better coffees, reported on location, and discussed coffee-related research and what bird species benefit from shade coffee. I appreciate the work Julie puts into that site so I am happy to see that it is up for an award. Go vote for Coffee and Conservation! My local patch, Donaldson Park, tends to have the same set of 25-30 species each time I walk there. Since the species set is so predictable, I try to make it interesting for myself mainly by keeping track of the numbers. Yesterday it had a few "rarities": a Snow Goose, a Pied-billed Grebe, and a Common Goldeneye. Today, though, I found a life bird there. The life bird in question was a first-cycle Iceland Gull. I saw it near dusk, in a flock of several hundred Herring and Ring-billed Gulls in the pond on the east (downstream) end of the park. I was able to view it for several minutes at relatively close range before it took off with the rest of the flock. The Iceland Gull was close in size to nearby Herring Gulls, but perhaps slightly smaller; it was definitely larger than the Ring-billed Gulls. It was definitely not large or massive enough for Glaucous or Glaucous-winged Gulls. It had a small, thin, mostly dark bill, and its eye was noticeably dark. Its feathers were almost entirely white, so that it stuck out like a sore thumb among the dark-winged gulls. There was some dirty brownish speckling or shading on the wings (particularly the flight feathers) and on the belly. The mantle had a hint of light gray shading or speckling, which was only noticeable at certain angles. I did not see where it went, but almost all the gulls seemed to be headed for some roosting point downstream. There was a steady stream of gulls passing overhead in the same direction while I was looking at the Iceland Gull. It may well turn up at Donaldson Park again or at another nearby location. According to a Virginia newspaper (via), a young bald eagle was recently rehabilitated and released after being poisoned from scavenging at a garbage dump. According to reports, the bird had fallen so ill that his could not fly, stand or even lift his head. When approached by worried onlookers, the bird did not resist being handled – another sign something is wrong. The bird was taken to the Midway Veterinary Hospital in Chesapeake, and was then sent to the Wildlife Center in Waynesboro. For two days, staff members tested, observed and treated the sickly eagle before deciding he was getting strong enough for release. I am not particularly surprised at this story – either that a young eagle was scavenging at a landfill or that it was poisoned as a result. Bald eagles are opportunists and will take meals however they can, whether that means hunting on their own, stealing prey from other birds, or scavenging. What would be interesting to know is the reason for the poisoning. Was this the result of spoiled food? Or was the eagle poisoned by contaminants within the landfill? I could see either as a possibility. Yesterday morning we set off for New Jersey's Meadowlands. As I have written before, the Meadowlands area is part nature preserve, part suburban development, and part post-industrial wasteland, with a sports/entertainment complex plunked down in the middle of it. Despite its oddness (or perhaps because of it? ), the area offers excellent birding and attracts some unusual species for New Jersey. DeKorte Park is perhaps most reliable for its masses of wintering waterfowl. In that regard, the day did not disappoint. Among the flocks, there were a few Northern Shovelers, Gadwall, Northern Pintails, and a Green-winged Teal, with somewhat larger flocks of Canvasbacks, Buffleheads, and much larger flocks of the other usual suspects. (There were between 250 and 300 American Black Ducks, for example.) The reported Eurasian Teal, which I saw last year, was not present today, as far as I could see. Songbirds were pretty sparse, but there was a nice flock of American Tree Sparrows along the Transco Trail near the Kingsland dump. Other than that the only noteworthy songbirds were a few Ruby-crowned Kinglets that were hanging around a small group of cedars. Those two species were among several of my sightings from the day that gave eBird fits. The real treat was the raptor show that continued all day. There were at least three Rough-legged Hawks, and it would not surprise me if there were more coursing among the retired garbage dumps. The two we saw in the morning were both light morphs. One hovered at relatively close range over the Kingsland dump; the other exhibited similar behavior over the far dump to the west of the park. The latter appeared to be an immature, as its white wing panels were apparent at a great distance. In the afternoon we saw the Kingsland light morph again (at least I presume it was the same bird). It was joined by one dark morph – the first time I have the latter form. The roughlegs were accompanied throughout the day by an assortment of Northern Harriers and Red-tailed Hawks, as well as an American Kestrel and a Peregrine Falcon. After leaving De Korte Park, we checked for the Snowy Owl that had been reported near the entrance to the park. It was still present along Valley Brook Avenue around 1:30 pm. The owl had moved from the ballfield to a construction area across a side street (Woods Court? ), as someone was flying a toy helicopter in the ballfield. It was still close enough for a satisfying view – a much more satisfying view than the first time I saw a representative of the species. The Rough-legged Hawks and the Snowy Owl combined to give us a little taste of tundra bird life in New Jersey. There is a bird, or rather what's left of an ex-bird, in this picture. Any guesses? It turns out that the ongoing environmental disaster in Tennessee is worse than advertised., according to independent tests conducted at Appalachian State University. Tuberty and Babyak conducted tests for 17 different heavy metals in triplicate using standard EPA methods. The samples were collected on Saturday, December 27 by Watauga Riverkeeper Donna Lisenby from three separate locations on the Emory River. The results should not be at all surprising since there was a tremendous amount of toxic waste dumped into the failed impoundment. Unfortunately both the TVA and the EPA have been slow to respond or issue warnings. So far, the only official tests that have been released were taken upstream from the spill, on the Tennessee River rather than the Emory River. Plus there has been no public release of soil or groundwater tests. The public has a right to know whether or not their water is toxic, so the two agencies ought to release the tests as soon as possible. The wild Whooping Crane population at Aransas NWR stands at 270 individuals, a new winter high. In other winter irruption news, the Northern Hawk-Owl in Peru, NY, is drawing a lot of visitors. The National Park Service is working on a new management plan to protect Piping Plovers at Cape Hatteras National Seashore from off-road vehicles. Here is something one does not often see on a bird count: a Northern Shrike took the head off a grosbeak while counters watched. Scientists found a new population of the critically-endangered Honduran Emerald. The Boston Globe explains why birds can sit on an electric fence. Our local newspaper, the Home News Tribune, covered the Dismal Swamp portion of the Raritan Estuary CBC. Nightjar: To List or Not to List: But what program? The species composition of temperate lake algae has changed over the past two centuries, probably due to climate change. Climate change is likely to change groundwater supplies more drastically than it will change rainfall totals. As Chris mentioned earlier today, January 1 is a great day for birding because everyone's current year list resets to 0. For those of us who keep year lists, that means that almost every bird we see, today and for the next few weeks, has a good chance to be a new species for the year. With that in mind, I went out for a short walk around my local park this afternoon. Birds were pretty scarce, probably due to the extreme cold (for this area, anyway). Usually there are a lot more gulls and waterfowl, but not this afternoon. I saw a lot more Song Sparrows than usual, as well as a big flock of Dark-eyed Juncos. Common Mergansers only showed up within the last week; I think that the relatively mild weather must have kept them farther north longer than usual. Below is the eBird output from this afternoon's walk. The one day bird missing is a House Sparrow I saw shortly before leaving the house. I recently had the pleasure of reading Birds in Flight: The Art and Science of How Birds Fly by Carrol L. Henderson. This coffee-table book combines an informative text with beautiful photographs by the author. Henderson was captivated by flight when he was growing up, and his interest was increased by his experience as an Air Force pilot. His fascination is evident throughout the text. The first part, "The Art of Birds in Flight," shows a series of photographs of flying birds from many bird orders. Each photograph is accompanied by a paragraph or two describing the location or circumstances in which Henderson took the photograph. Many of the photographs in this section are blurred or grainy, or otherwise not as sharp as one would like. The blurred photographs are still intriguing, however, because they show unusual behaviors – such as birds flying upside down. A second section, "Aerodynamic Principles," explains the mechanics of avian flight. The section covers both basic principles of flight and how the parts of a bird's body – wing shape, bones, feathers, tail – contribute to its ability to fly. Most interesting is a discussion of how the varied shapes of bird wings and tails affect their flight and are adapted to specific lifestyles. Diagrams illustrate the forces that act on a bird's body, and photographs show the variety of feather and wing shapes. The final section, "On the Wing," demonstrates how birds put their adaptations to use. Once again, this section is beautifully illustrated with photographs showing birds in the process of taking off, landing, or executing other maneuvers. Each aerial maneuver is influenced not just by the bird's physical structure, but also how it positions and flexes its wings. Each bird species has its own distinct methods for taking off, level flight, and landing. I recommend this book for anyone interested in learning more about how birds fly. Carrol L. Henderson, Birds in Flight: The Art and Science of How Birds Fly. Minneapolis: Voyageur Press, 2008. Pp. 160; photographs, diagrams, bibliography, index. $25.00 cloth.